The public comment period has closed and all feedback has been considered and incorporated into the updated plan. This document is being reviewed by the Roland Park Community Foundation, as well as by key partners, including the Baltimore City Department of Recreation Parks, the Department of Public Works, and Friends of Stony Run. Once the final plan is approved and adopted, it will be posted here. 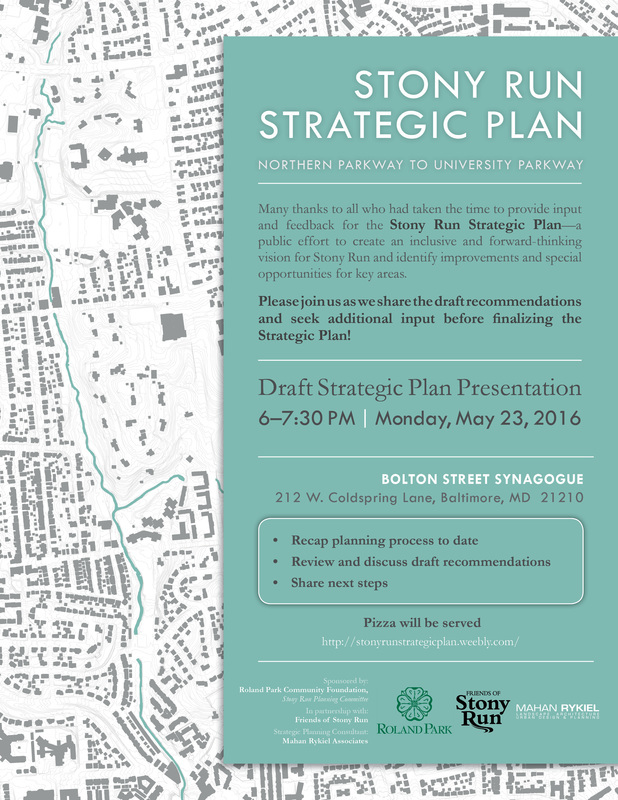 The Stony Run Strategic Plan DRAFT has been uploaded for public review. Should you wish to download the DRAFT Plan and save it to your computer (ideal page display view is as a two-page spread, with cover page showing), there is both a high resolution and low resolution version available. Additionally, separate PDF’s of the recommendation map exhibits are provided. The Plan can be accessed via the following links and also on the Resources page. Comments should be provided using the Comments Tab of this website and should be provided by June 30, 2016. Instructions for commenting are at the end of this post. Because of limited resources, this website, combined with the public meetings, walking tours, and online surveys, had been the primary source of stakeholder input. Focus group discussions with individual community associations, advocacy groups, etc. were not feasible. Review of this draft is the opportunity to comment on the recommendations and provide any necessary clarifications on background information that may be incorrect or additions of information/current initiatives that need to be included. Final formatting is not complete and some introductory text and implementation text needs to be developed. You will also notice that some photos are missing or low-quality. This will be addressed. Some stakeholders have commented on some of the recommendations and suggested changes following the May 23rd summary presentation but prior to the posting of this draft. To be fair to the process and to all stakeholders who have participated, we have kept the content of the draft consistent with the presentation; however, the draft provides further detail for each recommendation. Any changes to the content will be made following the review of this draft. Please consider individual recommendations in context with the entire plan and planning process. We appreciate your input, participation in this process, and commitment to Stony Run! ​Navigate to the Draft Plan Comments Forum on the Comments Page. To comment, you must login using a Weebly account or one of your social media accounts (Facebook, Google, PayPal, Twitter, Yahoo, OpenID, Aol, Microsoft, or LinkedIn). Logging in to comment will ensure accountability and transparency in the public process, ensuring that all voices are heard and given equal value. Once signed in, you are free to post a comment (please be specific where possible, and reference page numbers). Everyone is encouraged to view the comments of others and continue the discussion. The project team may not respond to each comment individually on this site, but will incorporate and consider all feedback in finalizing the Plan. Should you have any difficulty commenting, please contact the website admin. The Stony Run Strategic Plan project held the third public meeting on the evening of Monday, May 23, 2016. 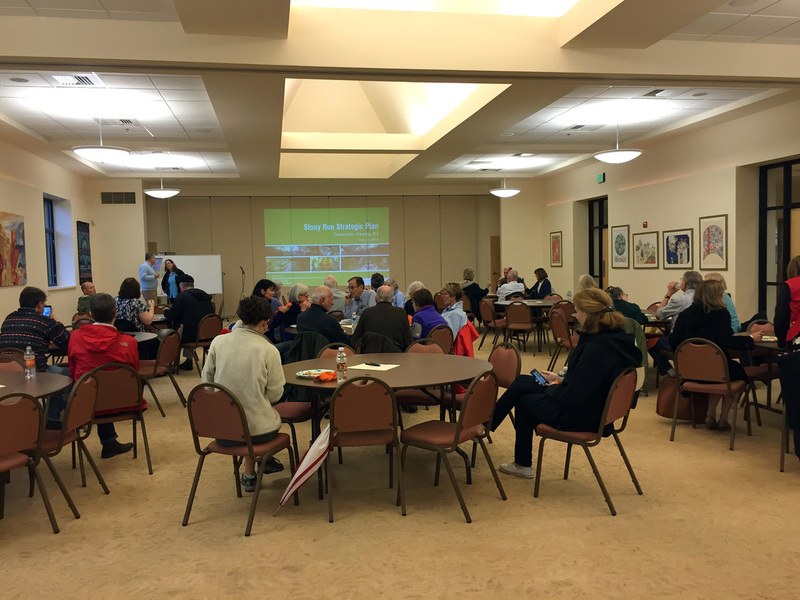 Despite the pouring rain, the event still drew more than 40 community residents and stakeholders. After presenting the draft recommendations, the project team opened the discussion to attendees, who provided feedback and opportunities for further clarifying the recommendations, which were crafted based on input received through two public meetings, an online survey, website engagement, and walking tours held earlier this spring. For anyone who was unable to attend the 3rd public meeting, the presentation is available for download. All comments are due by June 30th at midnight. *Should you encounter any difficulty signing in or creating a Weebly account, please contact the website admin. ​The Draft Stony Run Strategic Plan will be presented on the night of Monday, May 23rd. Second Public Meeting Reschedu﻿led for Feb. 27th! The second public meeting, which was cancelled due to this weekend's impending weather events, has been rescheduled for Saturday, February 27th! Please mark your calendars and plan to attend. ​We will briefly review survey and community input received to-date (also available on this website), present on emerging themes and the project team's preliminary ideas for recommendations, and engage participants in group discussions to collect feedback regarding diverse opinions. 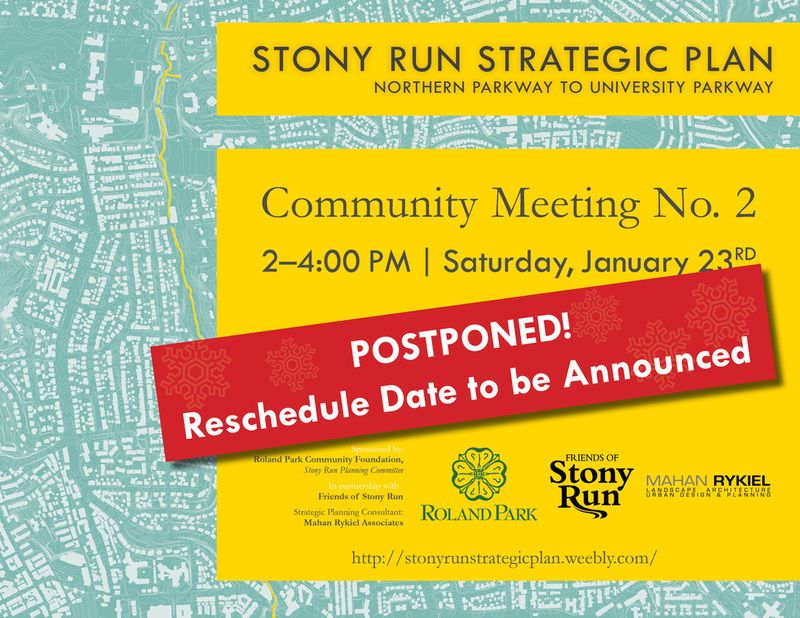 Due to an inclement weather forecast, the second Stony Run Strategic Plan meeting is being postponed. 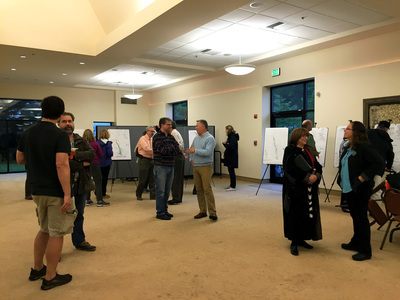 Public input is valuable and the project team felt that going forward with plans for this meeting, considering the weather forecast, could potentially do the project a tremendous disservice. A new meeting date will be determined shortly and details will be shared once the arrangements are finalized. Thank you for your understanding. Until then, please continue to provide input through this website! 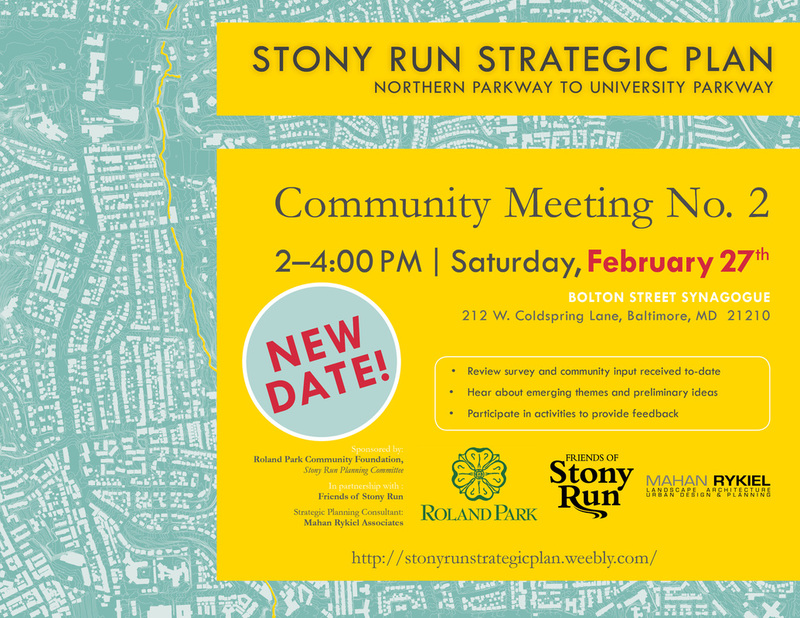 Join Us for the 1st Stony Run Strategic Plan Community Meeting! 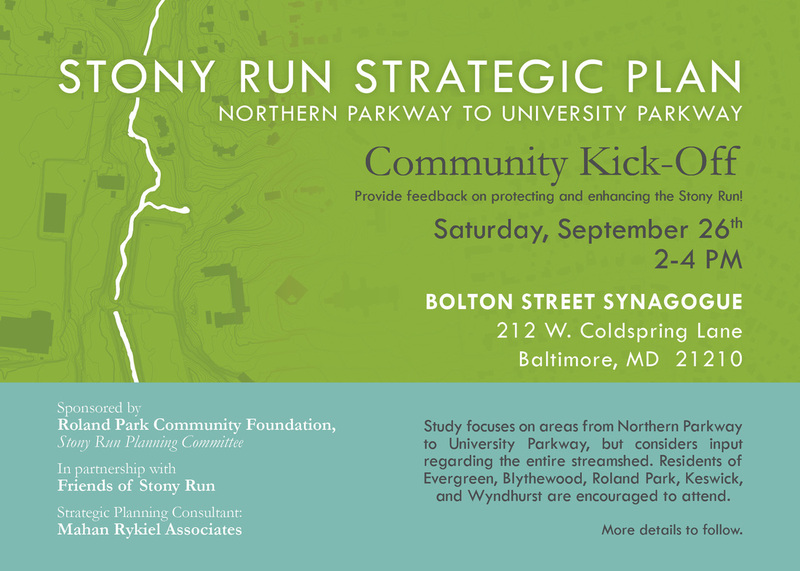 The Strategic Plan’s first Community Meeting has been schedule for September 26th from 2-4 pm at the Bolton Hill Synagogue on Cold Spring. Please plan to attend and encourage others who care about Stony Run to join us! Although the focus of the Plan is bounded by Northern Parkway to the north and University Parkway at the south, the development of this plan will be most successful if stakeholders from all areas are able to provide feedback regarding the entirety of the Stony Run and its associated park spaces. If we are to protect what is good about Stony Run and improve what needs work, we must know what these items are!! If you cannot attend, there will be other events and opportunities, including an online survey, to provide input and be involved.